In 2013 Princeton University published a well-received – indeed award-winning – guide to North American warblers. Its relevance to the Northern Bahamas is that all 37 species of warbler recorded for Abaco are found on its pages. Plus, you can use it in North America as a bonus! Details of the book are given below. 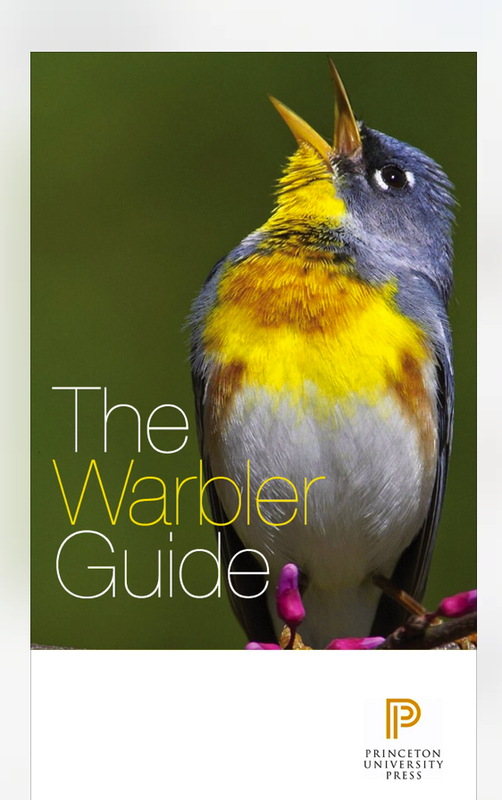 As a follow-up project, Princeton has now produced a Warbler Guide App that looks quite impressive at a glance. It’s not cheap, at £9.99 or dollar equivalent, but with bird apps you generally get what you pay for. Included are song/call IDs for a start, which takes the App a long way beyond mere visual recognition. And the illustrations are from several angles, taking account of the fact that you may not get an ideal broadside view of a bird in the field. Below are a few sample images. 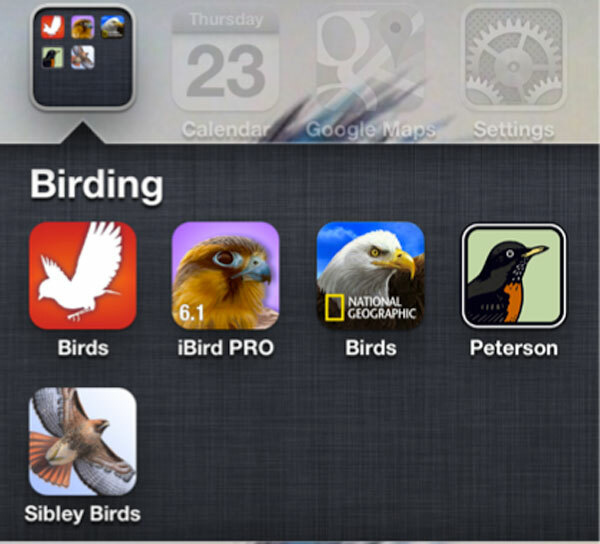 Boucher’s Birding Blog: Apps for the Smart Birder — Which One Should You Use? Timothy Boucher (@tmboucher) is senior geographer at The Nature Conservancy and a long-time birder. Follow him on Twitter. 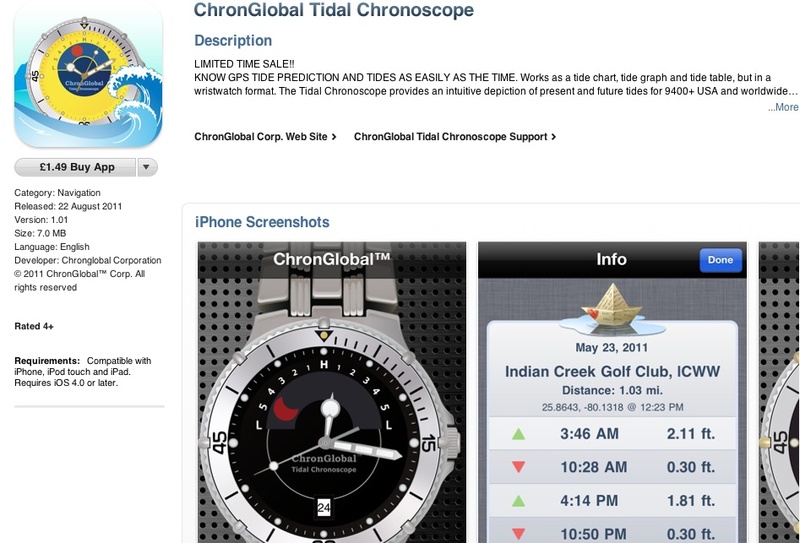 May 13, 2014: This post was updated by the author to include two new apps and other relevant information. 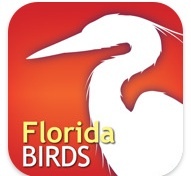 Need an app that helps you identify birds in the field? Don’t bother searching for “birds” in any app store. Unless that thrush happens to be angry, those dozens of Angry Bird apps that pop up won’t be of any use to you. 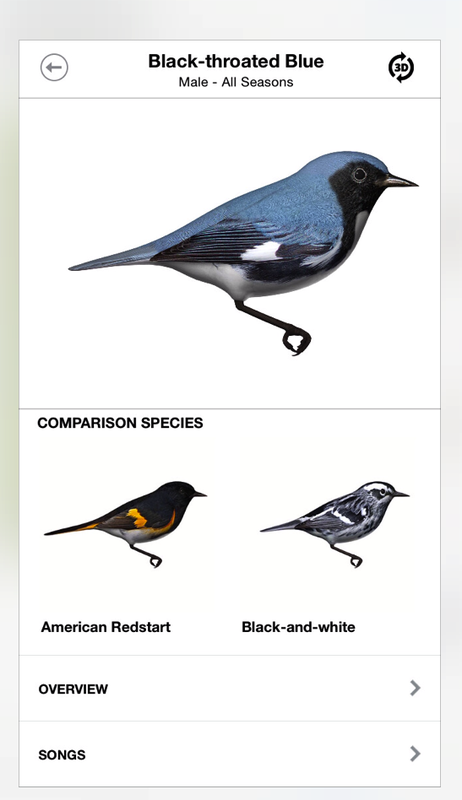 + Whether the app allows you to compare similar birds and in which ways. All 5 of these apps offer some bonus features — but generally, I am comparing basic features that all share. Of course, some things are a matter of personal preference, such as illustrations versus photos. All of these apps need a lot of space (and a WiFi connection) to download (~500 MB+), but then you can use them offline when in the field, which is very nice. A novice birder spots a bird in the backyard and would like to identify it. First, following Boucher’s Rules of Beginner Birding, narrow it down — big, small, hawk, warbler, woodpecker, whatever — you need to know a little to get started. But wait! Audubon Birds is already helping you do that. You can browse by shape (duck-like, hawk-like, perching, etc.). That’s pretty nice for the novice. Merlin treats you like a true novice — and leads you through a series of questions: location (allow GPS use), date (useful for season), size (with a series of useful images), choice of several colors, and what and where the bird was. It then creates a list of possible choices. Hidden in National Geographic Birds is a way to something similar — filtering the search by color, size, habitat, etc. — that should help narrow your choices down. 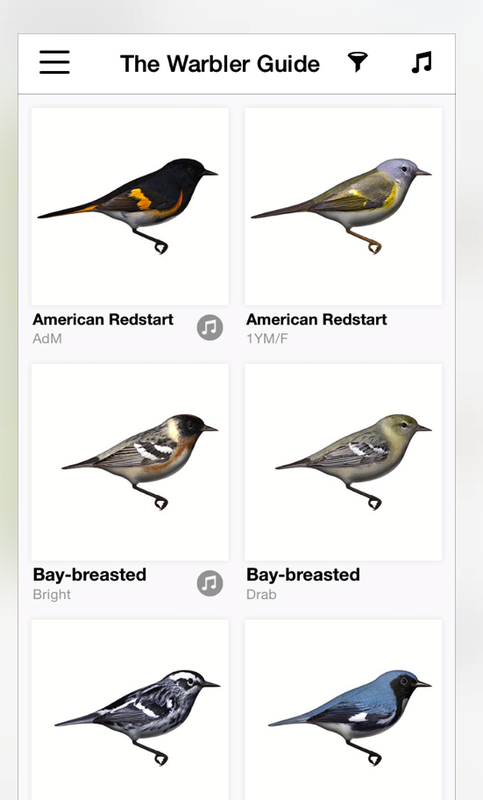 iBird has the same filter-type list, although a little more hidden under its search function, and Sibley eGuide to Birds also has a similar function under its Smart Search — though not as clever as Audubon’s! Peterson Birds has already fallen behind the pack — it only has a family list that I have to scroll through, with icons. Hmmm…that Grey Catbird that the other apps quickly pointed to is not so easy to find with Peterson. Finally, BirdsEye is not really set up for the novice – allowing you to either search for or scroll through birds that have been recently seen in your location (based on eBird), but you really have to know what you are looking at to find it. So for a true novice trying to find a bird, I think Merlin and Audubon, followed closely by National Geographic lead the pack, with iBird and Sibley, with BirdsEye and Peterson bringing up the rear. Next, assuming you think you might know what the bird is, how quickly can you find it to confirm? And what type of images are they, how many and (lastly, and the most subjective) how’s the quality? Let’s graduate from the catbird to something more challenging — a Wood Thrush. It can be confused with a few other similar thrush species and has a song that can be similar to others too (that is the toughest test). And remember — in all of this testing, time is of the essence. The quicker you can get to a bird, the better! Note: Playing no favorites, I review each app in alphabetical order. Also, the apps do get updated every so often (once or twice a year), but mostly with new images and bug fixes — new feature updates are much rarer. Audubon starts up quickly and has a nifty little search box as the top of the screen. Typing in “wood t” quickly gave me Wood Thrush, and one tap took me to the bird (took about 3 seconds). Nice! I could also browse by family to get there (3 taps and some scrolling) — but quite a bit more slowly. Once at the Wood Thrush entry, Audubon presents me with four good photos (NOT paintings), with a range of options at the top: map; voice (more on that later); description; similar (more on that later); share and sightings. Voice is VERY important to both the novice and advanced user. 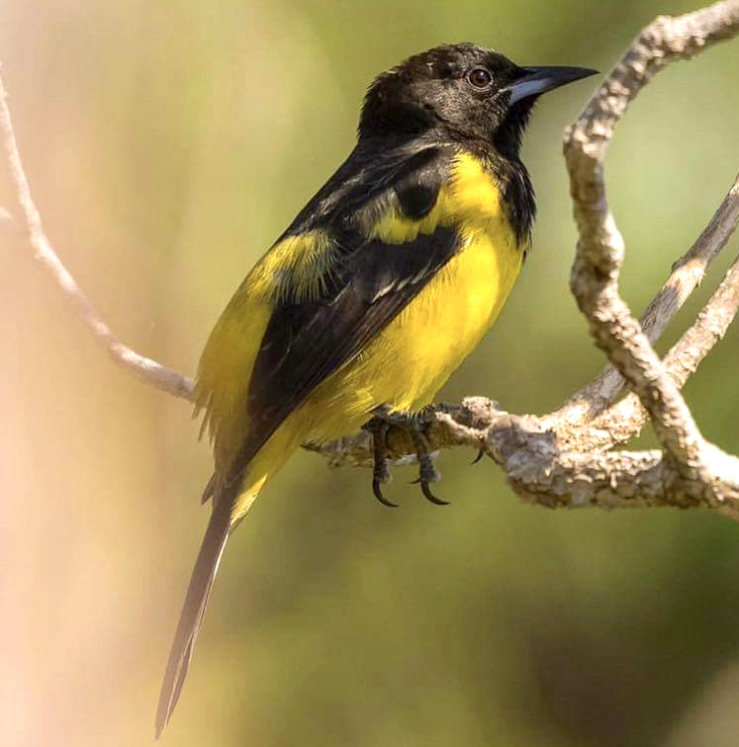 Audubon offers 5 recordings for this species! Excellent! Birds don’t sing or call the same everywhere or even seasonally. Audubon also compares the species to 11 others — a good range of choices, in mostly the same habitats — which is good. You don’t want to be misled by a grassland bird when you are in the woods. Audubon does NOT give birds with similar songs. Bonus feature? 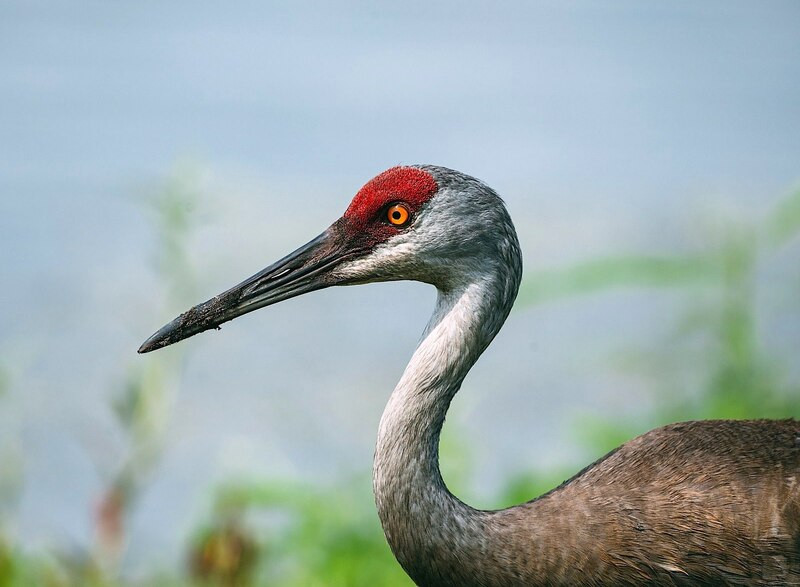 Audubon partners with Cornell to give eBird sightings — even using your GPS location! BirdsEye is a unique product in that it sources a lot of its information directly from eBird – specifically where birds have lately been seen in your region. It also has many versions – North America, South America, Europe and so forth – so it’s useful for outside the ABA region. I tested the North America version. It has a fairly simple initial interface, “browse birds” the first choice, and typing “wood t” quickly brought up the Wood Thrush (including a small photo-icon) and its associated monthly abundance graph (and a red-line for the present date). Tap on that and you get a description of the bird. Tap on the photo and you get more and larger photos. Once in the description area, you can share the sighting, login to and use flickr, read the Wikipedia entry, see latest local sightings (sourced from eBird, which is very nice), and lastly, hear what the bird sounds like when singing. 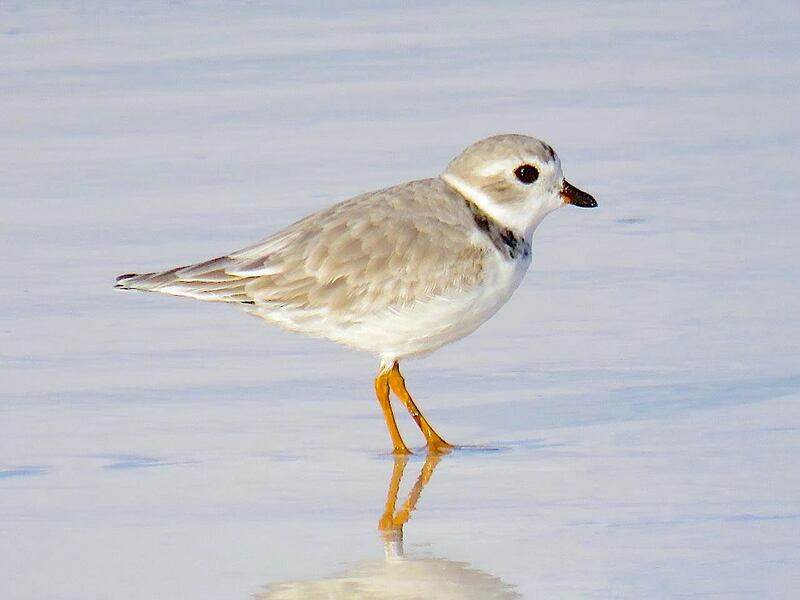 Note: when you are browsing birds, there are 3 tabs at the top – an “all” tab (in this case 1045 birds), a “recent” tab (birds seen recently in your area), and birds needed for your list (if your list is up-to-date on eBird). Apart from “browse birds” it also has an option to look at favorite locations, your world and regional list (as on eBird), local hotspot lists, and nearby notable birds (in case you want to chase down a rarity). BirdsEye also has a small audio icon at the bottom, which gives you a couple songs and calls. Bonus feature – BirdsEye is the only app that allows you to search using the USGS 4-letter alpha/banding code (e.g. BGGN for Blue-gray Gnatcatcher). While this might not seem like much, try typing “Black-and-white Warbler” with your thumbs, not so much fun! It also trains you to use the 4-letter code when using the Birdlog app; just refrain from using them in conversation – telling others you saw a HOWA, KEWA and WEWA might confuse (or annoy) them. Next up — iBird Pro — the first birding app on the market! No muss, no fuss; either type in “wood t” or scroll alphabetically or taxonomically. Bingo, quickly to the bird in question — Wood Thrush. It’s a single (but decent) painting along with a range map, photos, sounds, similar species, field marks and other identification tips (bird specs), facts (notes), your notes, ecology, links to Flickr (more photos! ), Birdpedia, etc. There are only two vocalization choices for this species (one song and one call/chip notes, so adequate), but very importantly, iBird serves up two similar sounding birds. Very nice! And iBird also gives the spectrogram for geeky birders who like to visualize the song. 13 similar-looking birds are listed, including some very unlikely European species. While this one is free (which is a big plus if you just want check birding out), it covers only 350 of the most common species (I tested version 1.02) – which is most of what you can expect to see anyway. More birds will be added soon, as will the Android version (expected by June 2014). It uses only photos (a good selection), has a good representation of songs and calls (singing and chip notes) of each species (it is from Cornell after all! ), and includes a good size map of each species showing ranges in the North American continent south to Panama using different colors for winter and summer ranges. As previously noted, you are taken through a series of questions and given a list of possible birds to choose from (based, in part, records on eBird). You can also browse all the birds. It has a search input area at the top and an interesting scroll bar of different shapes of birds to choose from, which means that similar birds ( think vireos and warblers) appear near each other. I did find the bar a little annoying if my fat finger strayed onto it while scrolling up or down – I would get a big jump (especially if using my right hand! (Note to self: use left thumb for scrolling!). A note on the birds not dealt with in this app: While more birds are being slowly added, this app is aimed at the total beginner/novice. Many people will prefer a more comprehensive guide sooner or later. All in all, it’s a great guide for people at who are just starting! Bonus Feature – Did I mention it’s free? National Geographic opens quickly and an extra tap brings up the text search box, where typing “wood t” brings up Wood Thrush. The layout is neat, uncluttered, with the paintings from the paper field guide. Though small, the illustrations can be enlarged with pinch-zoom. A map and sounds icon appear below the illustrations. Sounds are adequate, with one song and one call for this species, including the spectrogram. 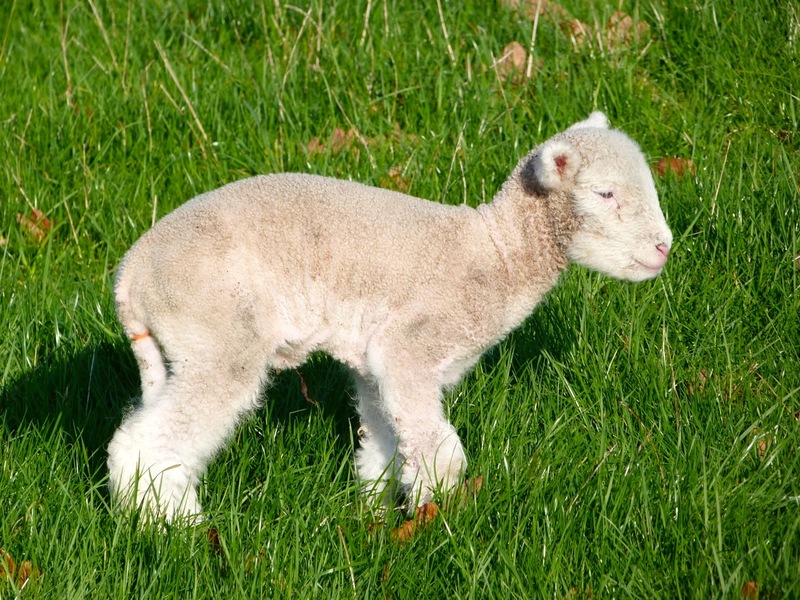 Comparisons with the songs of three other species are available. Under visual comparison, only one species is given, and it is an odd choice — the Brown Thrasher. It is brown, but much larger than the thrushes and a different shape, whereas the other thrushes are much closer in appearance to the Wood Thrush and much more easily confused when seen in typical thrush habitat of dark wooded understory. So points off there. Peterson also needs only two taps to get to text search, and typing “wood” gave Wood Thrush as the top choice. A large painting, as found in the paper guide, is offered, above icons for sounds (only one song), map, nest, ecology and family notes. The very simple similar species section shows only the American Robin — which is nothing like the Wood Thrush. 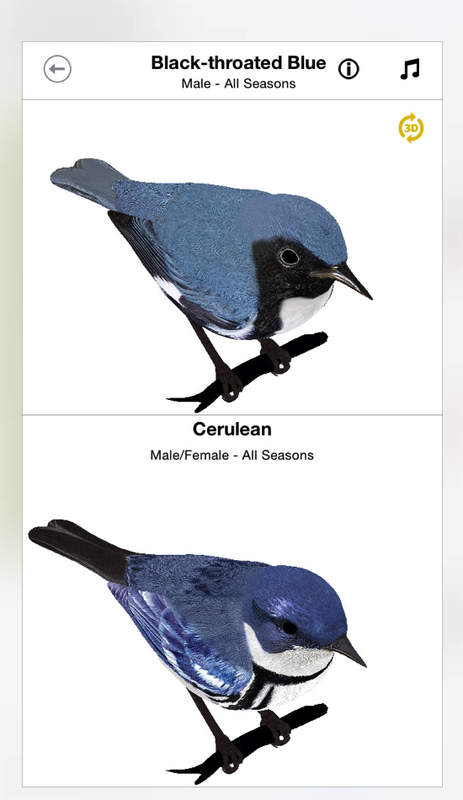 You can also browse species by family icons, where it is easy to compare birds and calls by just tapping on the images, or a plain text list. This is a bare-bones app, and the price reflects it (see below for price comparisons). Lastly — Sibley. Two taps (either taxonomic or alphabetic; no fussy scrolling!) to the text search and typing “wood” gets Wood Thrush and an impressive array of large Sibley illustrations for each species to scroll through. On the right are two small, neat icons for voice and a distribution map. The song/call section has six recordings, the most of all the apps. No sonograms, but most people don’t use them anyway. Downside — Sibley doesn’t have listed similar species for each species, either visual or aural. In the initial search area, the “comp.” button will bring up both visual and aural comparisons. Sibley has the most illustrations, and for many people — especially those who prefer Sibley’s artwork over photos — this is a popular choice. All these apps are fairly low-cost, so price is really not an issue. As I noted, Merlin is free but limited in birds covered (with more coming); Peterson is bare-bones in features and very cheap at $2 (but also apparently varies greatly in price). Audubon, given all its features (notwithstanding the use of photos), is the best value at $4. National Geographic, with great illustrations and neat layout, is the middle ground at $10, with Sibley, iBird Pro and BirdsEye (NA) the most expensive at $20. Sometimes these apps get discounted to just a few dollars, so keep an eye out for those opportunities. Important! On the front page of Sibley, there is a little reminder for all app users: “Please consider the birds and other birders before playing audio recordings in the field.” This is to remind you that playing the recording of a bird’s call, especially in breeding season, may be harmful if done near the bird in question. And may be illegal in some National Parks. And is always illegal for endangered species. And it will annoy other birders. So just don’t do it, ok? 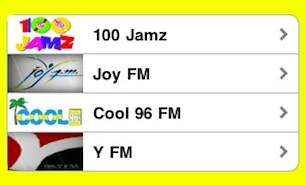 UPDATE FEB 2013 This fab app has massively expanded since it launched, with further additions planned. It’s now extremely comprehensive, and there are some wonderful photo and video libraries. It’s still free. What are you waiting for? This app does a great deal – indeed it is a one-stop portal for many of the Abaco, Eleuthera and wider Bahamas organisations, NGOs, science & environmental sites, wildlife blogs etc that many follow. And with a photo section! It is designed to make sharing easy in all familiar formats. The official description will give you a pretty good idea of what is covered, so I will add it in full below. I can’t help but notice in the image to the left the words “Rolling Har…” in the top menu. And yes, astonishingly this frankly somewhat haphazard blog finds itself in exalted company on the Planet of the Apps. It’s a bit uncomfortable with that, but delighted to have been allowed a small part to play in the venture. 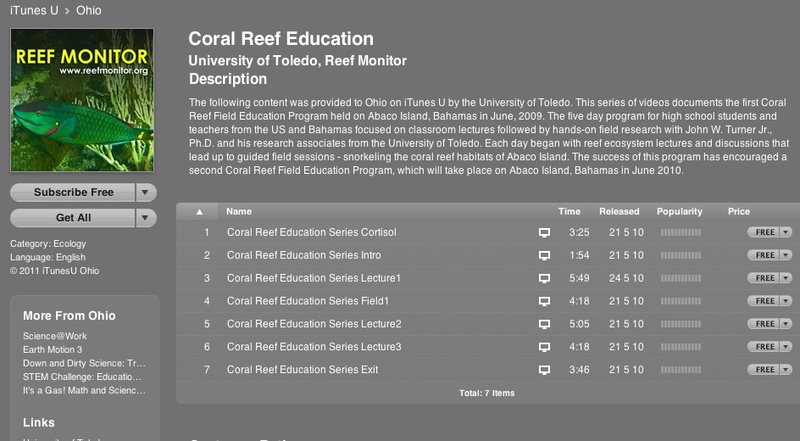 My minor participation in the project (and natural diffidence) inhibits me from giving this excellent resource the 5* rating it so obviously deserves, so I’ll simply say that I think the many people interested in the natural history, the science and the environmental issues of the Bahamas will welcome this new app as a valuable, constantly updated resource. 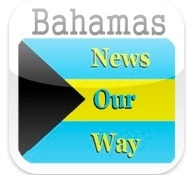 “The Click242 app is your daily dose of what is going on in the Bahamian environmental field. 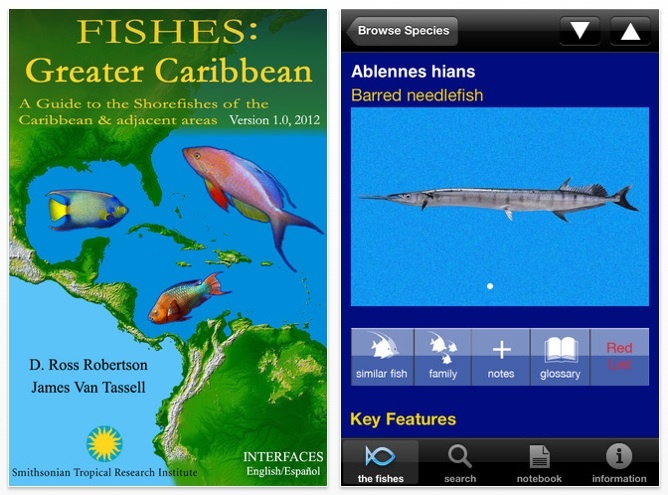 This FREE app is designed to increase public awareness about the Bahamian environment and the organizations which work to educate the public and manage the country’s natural resources, including protected areas. It allows resource managers, users, scientists, students, teachers, visitors and interested persons to connect with various environmental groups and stay up to date with the latest blogs, activities, photos, videos and events within the environmental arena”. CLICK242: NATURE INCLUDES THE FOLLOWING FEATURES Science Blogs from the Abaco Scientist, ROLLING HARBOUR and the Cape Eleuthera Institute. Featured Content covers projects and new efforts in the environmental arena. HIGHLIGHTS Photos from across The Bahamas, posted by featured organizations; Current Facebook pages for various environmental organizations and groups; Easily navigate to and watch videos from featured groups and YouTube; Articles, news, blogs, photos and videos can be shared with your friends via facebook, twitter and email. I’ve just put this on my iTimewaster, and first impressions are that this is a seriously useful app from the Smithsonian, certainly from a layman’s point of view. Be warned that it is extremely comprehensive and therefore takes up 0.5 gb of space, so on an iPhone you may have to remove Angry Birds completely to make space, plus your most recent impulsive and misguided music downloads. 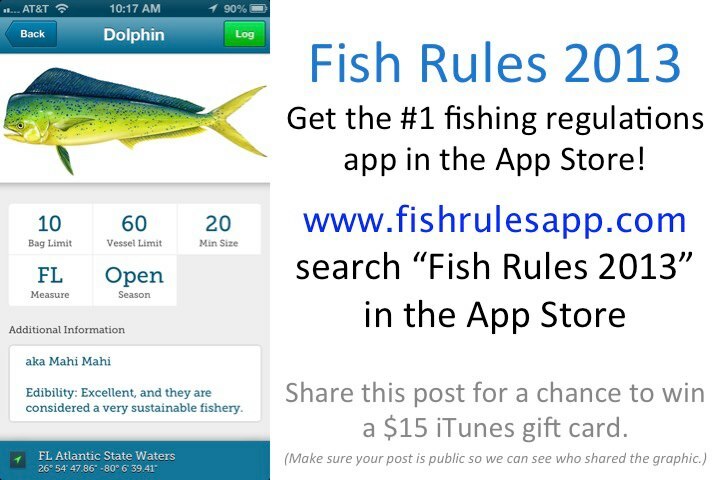 The first option is to browse fish by species or family. Either will take you to first-class photos (some drawings) that really look like what you see underwater (not every app is so good). 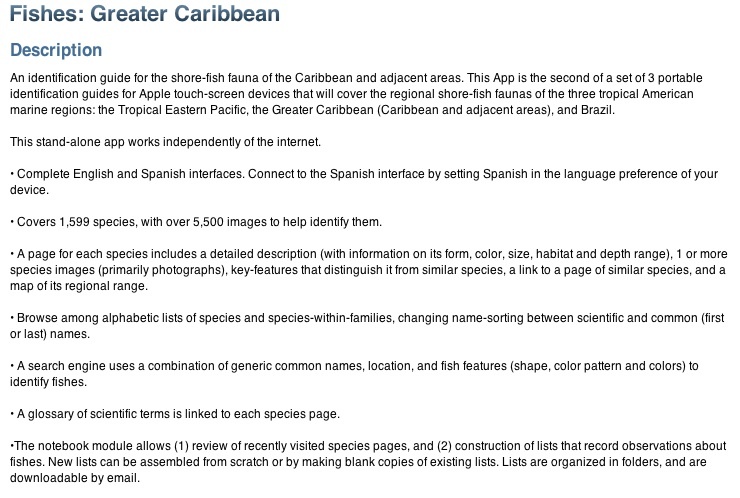 You are offered a helpful ‘similar fish’ option; there’s a notebook to enter your data; a glossary;and the IUCN status for each fish. The descriptions are clear, as are the range maps for particular species. There’s also a very good search feature for when someone tells you to look out for the ‘Lucifer’s Gonadfish’ at Fowl Cay and you have no idea what one looks like. (If they exist. Which they don’t). This is subdivided into name / location/ shape/ colour pattern and colours options to help pinpoint the fish. Later you can even recall ‘recently visited species’. Crits? Very few at first glance. The odd typo. My inital search for bonefish by size (over-optimistic, of course) led me to the larger ladyfish, but a search by name took me straight to it. The most significant confusions may arise from the present ‘single image’ ID format. For example, if you look for the uncomely greeny-blue adult male stoplight parrotfish, you may be surprised to find the prettier black, white & red female pictured. Similarly, you won’t find juveniles, such as the small blue-with-yellow-spots yellowtail damselfish. But these are small points in an app with such a large scope. Anyway, who knows what upgrades will follow? 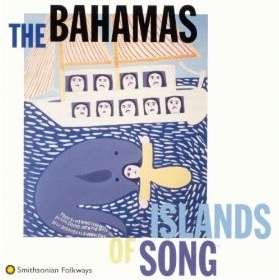 “This compilation of music from the Bahamas includes goombay rake-and-scrape dance bands (goombay refers to both the skin drum and the ensemble as a whole), spirituals, and fingerpicking guitar music. All the performers on this recording participated in the 1994 Festival of American Folklife, an annual event presented on the Mall in Washington, D.C., by the Smithsonian Institute’s Center for Folklife and Cultural Heritage. I have no idea how fascinating (or otherwise) these podcasts are, and I haven’t checked how annoying the presentation is (a problem with some podcasts). However they look as though they might be of interest to those who want to know more about coral reefs, their ecology, and the problems they face. The podcasts are based on lectures given in Marsh Harbour, so they relate specifically to research undertaken on Abaco. There are two sets of podcasts, both aimed at a High-school audience rather than professionals. 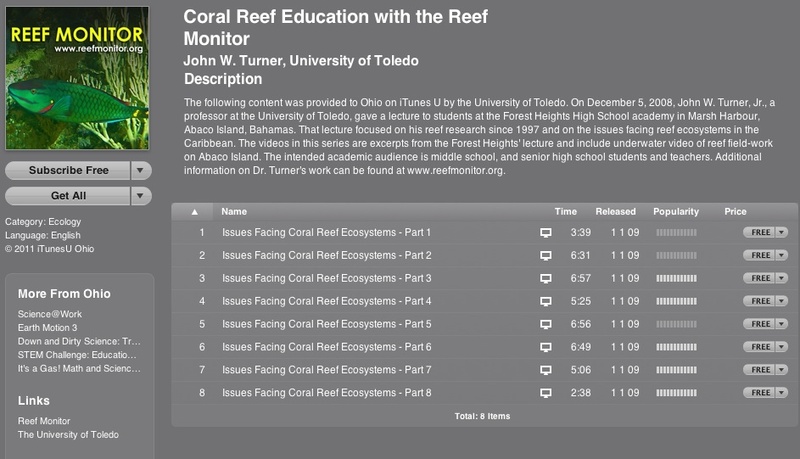 The videos include footage of field research on Abaco reefs. The ‘cover fish’ is a Stoplight Parrotfish. When (if) I get round to dipping in, I’ll add some comments. If anyone tries these, please leave a comment as to whether they are useful or not. CLICK IMAGES TO MAKE THEM LEGIBLE! ADVICE: If it’s free, save your time & mb-space. If it’s .59p, save your money too! 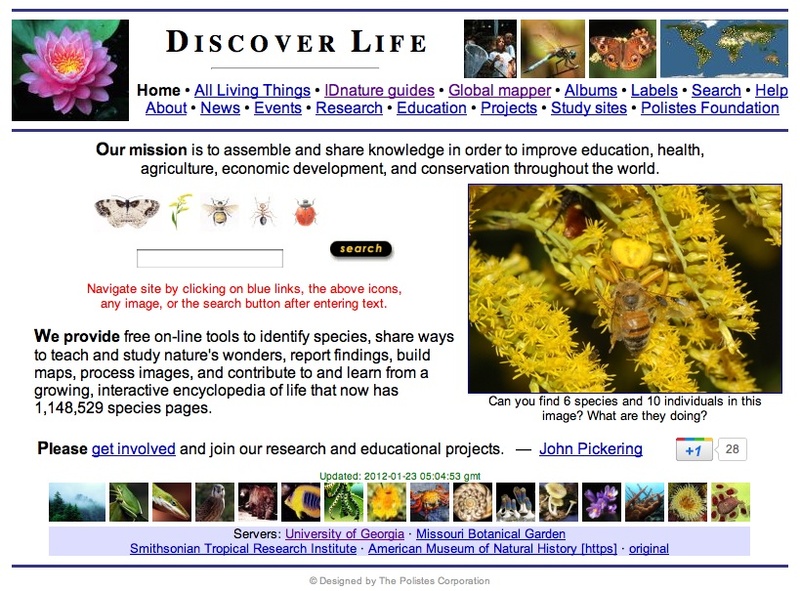 This marine life ID resource is so useful that in addition to its appearance in the blogroll as a direct link, it merits a special mention here. The site is divided into 2 main parts: Caribbean, Florida and Bahamas; and Tropical Pacific. Selecting the first, you’ll find a comprehensive guide that is prolifically illustrated with bright colour photos, with many species having click-throughs to a wide variety of different views and growth stages of that particular species. But it doesn’t stop at reef fish, although that coverage is impressive enough – 12 separate categories of fish, divided into sub-categories, from the largest ray and shark to the smallest goby and blenny. Pretty much all marine reef life is here: crustaceans, worms, molluscs, cnidarians (jellyfish, anenomes), echinoderms (stars, sea urchins), sponges, corals, algae – and finally dolphins and turtles. 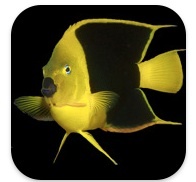 I’m fond of the Reef Fish App reviewed below – it’s easily portable on an iphone, for a start. However Florent’s Guide is the biz, and helps a great deal with ID , especially for anyone starting completely from scratch, as I have – not knowing a grunt from a wrasse. 2. Weather: daily details with maps and 5-day forecasts for each island, from the Bahamas Meteorological Department. 3. News: click-through to 8 bahamian journals, including the Abaconian (though that link wasn’t working today). 4. Search: direct links to bahamas-based searches on the usual suspects – Youtube, Google, Wiki, Twitter, Facebook etc. You never know quite what you will come up with. I will gradually post details of some Apps that may be of interest, not all of them avian-related. Apologies that they are iPhone-centric, I don’t do Android etc, but I expect you can get them that way too. 400+ birds, 1200 photos, 1000 songs / bird calls. 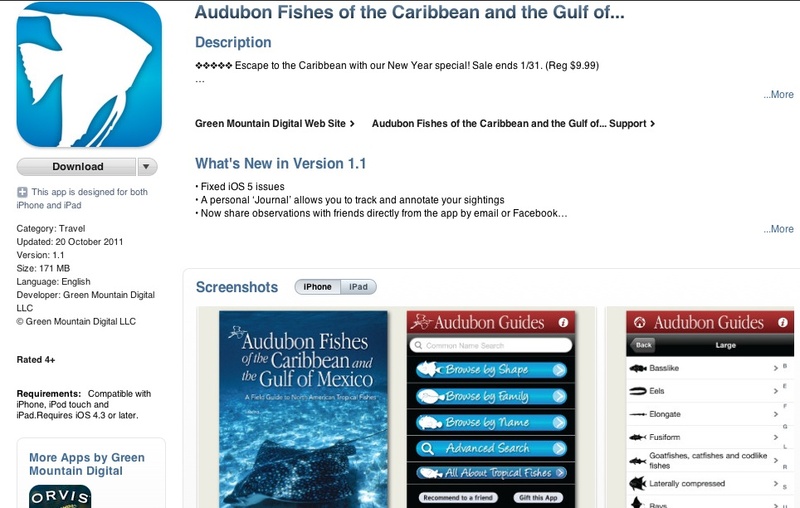 An excellent and good value App that covers much of the birdlife you will find on Abaco (and more widely than that). It’s a very good resource to supplement bird books, and it has the advantage of giving you some of the actual songs/ calls as opposed to those maddening book descriptions… “song is a prolonged phew phew twiddly-dee; call is a sharp staccato pip twit…” You can browse birds by Shape, Name or Family. There are silhouettes and very good photos, and you can store lists of your own sightings. You can even toggle straight to the camera on your iPhone to take a quick snap (though frankly Apple haven’t quite cracked the camera side of things yet). There’s a well thought-out reference section including birding and ID advice, notes on plumage etc, and lists of classifications, endangered species and so on. A truly amazing package for the price. A simple and cheerful little App that is primarily for identifying birdsong, or birds through songs. It covers the whole USA, but one can select a particular area. 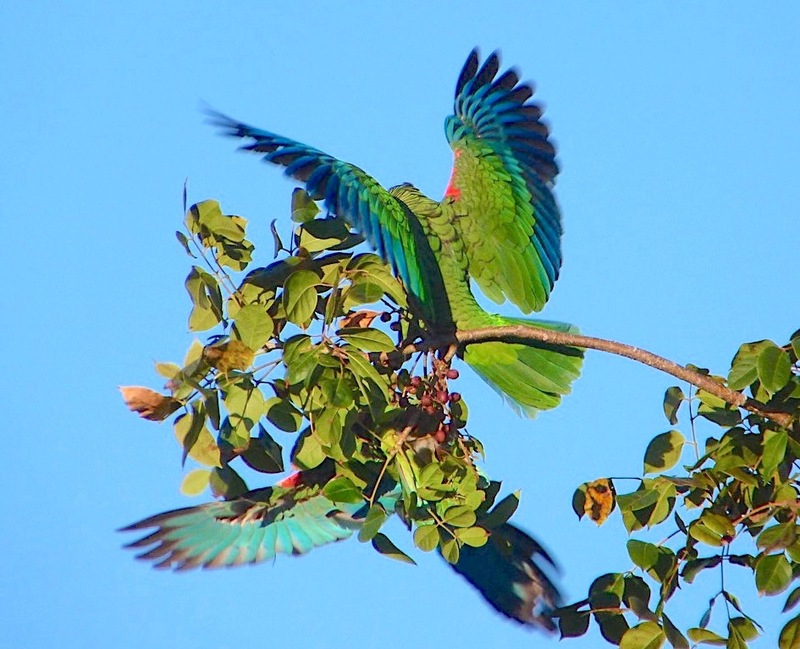 Choose Florida for example and you get about 130 birds and their songs, many of them also found on Abaco. This isn’t for sophisticated birders (who might not be entertained by the ‘Challenge’ game of matching song to bird), but it’s quite handy. I like it, anyway. A truly excellent resource for identifying shallow water fish, such as you might find snorkelling off the club beach, or on a reef snorkelling trip (about which, a post is in contemplation). The full version features, amazingly, nearly 450 fish photos (with notes on each) divided into 63 families; quite a number of videos; a slideshow; and the ability to ‘favourite’ individual fish, perhaps for blogging about later. Another App that is outstanding value, although nb it will take up a bit of space (about 50 mbs) on your phone. Again, there is a free ‘Lite’ version, with only 32 fish in 7 families, and 7 videos. So if you aren’t sure about getting the full App, it costs nothing to see how it looks.